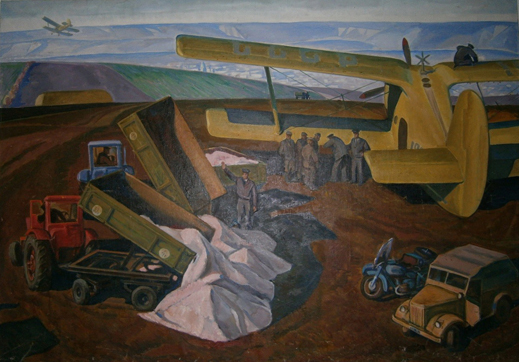 Entitled “The Yellow Airplane”, this is a Russian painting of the late Socialist Realist epoch. The artist signs himself Kazak, and dates the work 1960. I found it in Moscow in 1998. Later it disappeared for more than a decade. But several months ago it was found, and I’ve had it stretched again and mounted on my wall. In trying to trace the painter, I have found two Kazak names who qualify, more or less – Oleg Iosifovich Kazak, born in Minsk in 1935; and Vasily Ivanovich Kazak, born in Moldavia in 1938. Vasily Ivanovich is the most likely painter, as he lived and worked for most of his career in Belgorod region, and because “Belgorod” is written on the back of the canvas. He died in 1996. I’ve found only one other picture by the same Kazak, and nothing to compare to the beauty of the first. The painting comes from a time when it was possible to believe in building a civilized future in Russia, in Europe. Those whose wickedness you have been following here this year have taken us into a war from which there may not be enough time for us, you dear reader and I, to recover. For us, the yellow airplane isn’t a figment of the imagination, though if it were, it could not be shot down. What to think when midnight comes? Don’t think — dance. The trick is lightness, agility. Stretch out your arms; point your fingertips to their limit; turn in a slow circle. After your toes leave the floor, make sure your heels return to stamp – that’s the graves of our enemies we are dancing on, together. Take off again. Stamp your heels!